Geminivirus particle #1. The above image is 500 pixels across, the original measures 5000 pixels across. GEMINIVIRUSES are ss DNA viruses (family Geminiviridae) causing severe plant diseases. They have a unique twinned (hence gemini) icosahedral capsid. The genome (single - not twinned - shown in red here) occupies both heads and the neck of the virion. 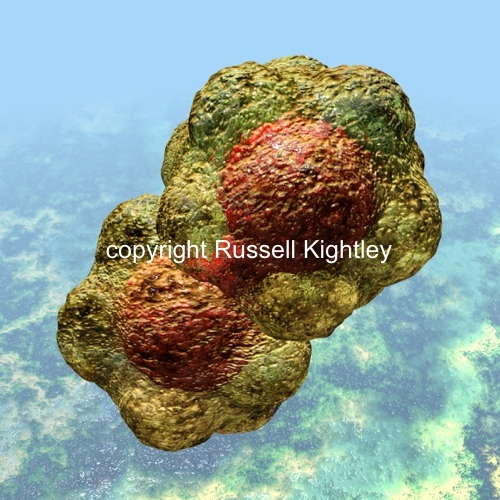 They are small (each icosahedral half shell is about 22 nanometers in diameter) and rather simple. With thanks to Ed Rybicki.